No More GCI for CA Great America in '09? California's Great America For Sale? 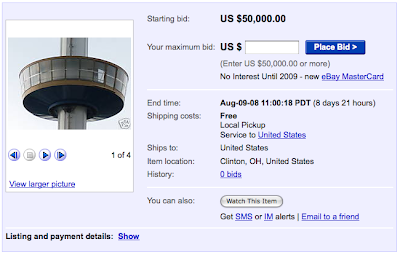 I don't understand why Geauga Lake's former Sky Tower (Intamin Gyro Tower) is listed on E-Bay, but it is. I think that considering a scrap metal company purchased it for like $12,500 at the park's auction it doesn't make much sense to now try to sell it for $50k. If someone wanted it that bad wouldn't they have purchased it cheap at auction? Well, anyway, here's a link to the ride's E-Bay listing: surprise, no bids yet. And no, not like the place is so awesome it's 'on fire'... like it was literally on fire last night. 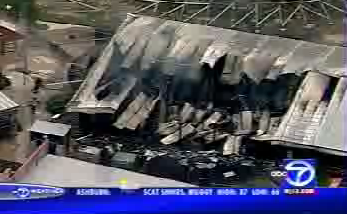 A warehouse type structure that contains a haunted house for Fright Fest caught on fire last evening. The park evacuated everyone including employees and closed for the day early. 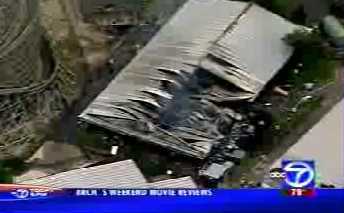 The news articles are reporting that the building is a complete loss. Here you can see that the warehouse was located right next to the park's GCI wooden coaster, Roar. Thankfully the ride did not catch fire. I know some people who have had such bad visits to this park that they'd probably wish the whole thing would have burned down... but joking aside at least no one was hurt at all. The L.A. Times' Funland Blog has a post with more details about California's Great America's new Halloween Haunt to take place this fall. The event will have 5 mazes, 3 scare zones, and two live shows, and plans on having 500 monsters at the event. This Haunt will be separate admission, so your daytime tickets will not get you into the scares. Funland has a list of the location of all the mazes and scare zones, and also points out that the park's log flume will get a scary makeover as well in their article here. Sounds great, can't wait for reviews! File this in the potential bummer category, according to this opinion piece out of the Santa Clara Weekly, Cedar Fair might have to delay plans to build the GCI wooden coaster at California's Great America in 2009. 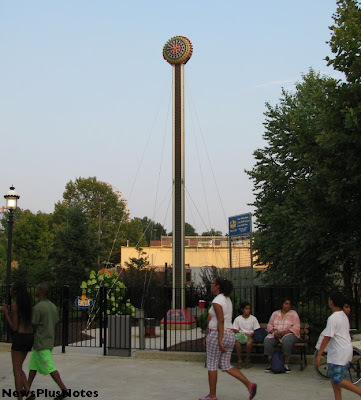 Even though the ride was approved, it seems that the Prudential building is still causing a fuss and now things are once again up in the air with the Planning Commission until mid-August, which the writer says is too late for Cedar Fair's taste. 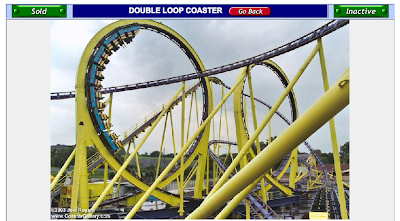 If this does end up falling through, could CA Great America's loss be Dorney Park's gain? We'll see. Here's an article from MassLive.com about Six Flags New England that I think is really pretty hilarious. It's basically about how everyone in the local government wants to work with the park better in the future to make sure there's no repeat of the failed Dark Knight coaster - ever again. But it gets funny where the Agawam Mayor is quoted as saying he's concerned that the park will move to another state. What!? It even says that someone at Six Flags told the mayor's office that the state of Connecticut was trying to 'entice' the park to their state. Yes, I'm sure that Six Flags has the capital ready to go to pick up an amusement park and move it. Right. 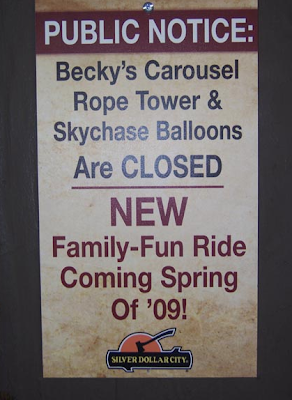 Kings Island has put up a bunch of new signs around the construction site for their 2009 hyper coaster. These signs lead me to believe that that is a snake eye of some sort on the park's website, after all. Not sure why my brain ignored "The Park Strikes Back in 2009" up until now, but it did. Here's a link to a gallery where you can see all the photos. Laser, at Dorney Park, has had its listing on UsedRides.com updated to reflect that the ride has been sold. That seals the deal for this being Laser's last year at Dorney Park. Go ride now while you can. 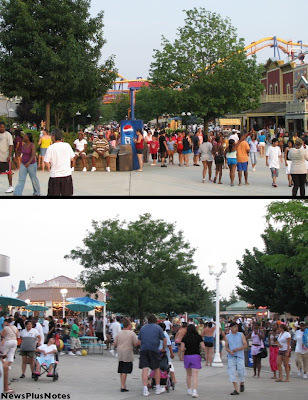 Been a while since I stopped by Dorney so I decided to head over and see what's up at the park on a busy July Saturday. They were in over, over, overflow parking. Basically, it looked like it was one of those days where they had to park cars anywhere they could. Behind Laser, next to Steel Force, just everywhere. I rarely see Screamin' Swing with people on it, let alone a line! Just two general views of how crowded the midways were. I don't personally always go to ride anything, and on those trips I love when it's crowded because of how alive the park feels. Meteor's line was out onto the midway, White Water Landing had quite a line, too. Voodoo's line filled most of it's queue - I timed a few dispatches and calculated they were running at about 450 pph. Ouch. At least it was open! And look, Laser had a long line! The only had one train on. I didn't time any dispatches here, because I didn't have the patience to even make it through on cycle, it takes that long. I did time some Steel Force dispatches, though. With three trains the crew was doing a fantastic job and my figures put them at well over 1,200 pph. Kudos. 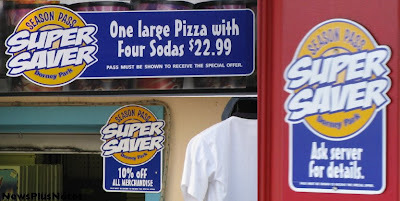 The Season Pass Super Saver program is in effect, I found these signs at some locations in the park. There's probably more but I didn't see them. The building for Club Blood is up in the backstage area next to White Water Landing. Can't wait for The Haunt! 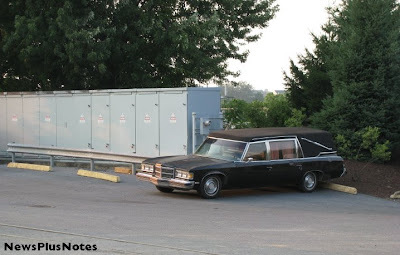 Noticed this new hearse in the backstage area also... I'm sure it's awaiting a custom paint job. They are building a permanent structure for the time share sales people. I know that's what this is because I asked. Ugh. Another view. At the very least the structure looks not horrible itself. And, I just found it really odd that this game was closed with no prizes out or anything. Maybe it's broken? You'd think they would have it open with a gazillion people at the park today if they could! 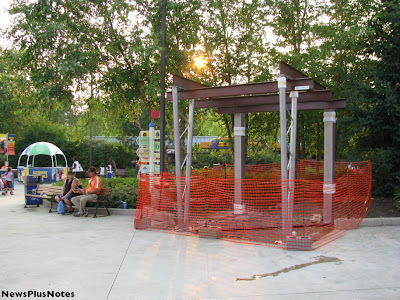 SDCFans has some photo updates of what's been going on at Silver Dollar City recently. As reported earlier, they have started work on a new attraction for 2009, rumored to be some sort of splash battle ride. Photos of that work can be found here. The park is also getting ready to open their new culinary arts school, here's some photos of that. Lastly, work has been going on for the theme park's improved parking facility, you can see that here. Yep - I was at it again ... if you want something to check out on this lazy, hazy summer afternoon - Live Local now has bird's eye views of Canada's Wonderland. This should get you there. Behemoth was under construction, just about ready to be topped off when the images were taken. So late fall of 2007 or so. Another one of Behemoth. I'd really love to visit this property! This news article about the ongoing drama over the plan to build a new 49ers stadium in the parking lot at California's Great America says that Cedar Fair wants more than $110 million to sell the park. The article also talks about how Cedar Fair wanted to reduce the assessed value of the park with the county tax office, and how that $44 million assessment makes the selling price of $110+ million crazy. What's crazy is that people commenting in the article don't understand the different between something's assessment value and selling price. Why would Cedar Fair practically give away the park on the cheap when the 49ers came to their back door and asked to build a stadium? 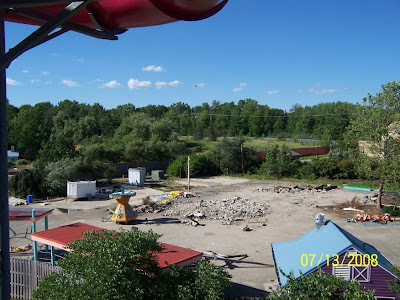 Here's a link to a thread on Geauga Lake Today that has photos of the Geauga Lake demolition of Villain and Double Loop from inside the park - and other park photos. Look at that turn on the Villain! Can you imagine if that's how it was when it operated ... reminds me of the crazy stuff you'd see on the old Harry Traver coasters. While the photos are depressing, there is some good news. The Geauga County Historical Society did raise enough money to get the Hay Bayler building out of Geauga Lake before it was demo-ed. Now they will work on raising the funds to rebuild the structure and turn it into a mini museum of sorts for the park. Stay tuned. 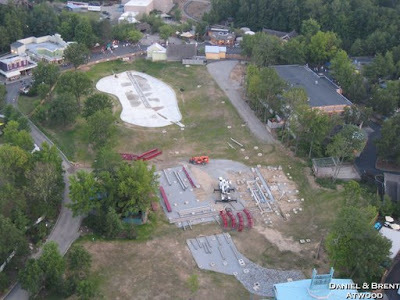 Here's another gallery of photos from Kings Island of the 2009 coaster construction site. They've moved supports for the ride onto the site, and they are indeed a light brown, cream color. There's a whole bunch more track pieces on site as well. Also, apparently the ride might be snake themed after all? I keep getting info going different ways on this one. Kings Island has added a page to their site to tease about the announcement of their new coaster for 2009, which will be August 6th. It's pretty confusing though. 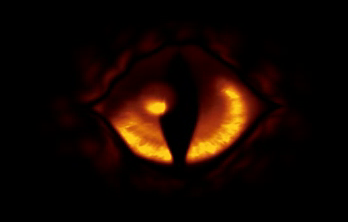 There's three videos on the teaser page, all of which start with what looks like a reptile or cat eye (or a Jaguar eye) checking you out, and then each has footage of either someone running or a POV of something running in different landscapes. Then at the end of each is a scream or something similar. On top of that, the code for the teaser page is titled "BEHEMOTH." Also, track for the ride has started to be set out in the construction area, as seen in the photos in this Picasa album and in this KIExtreme gallery. The track is a dark cherry red, at least that's how I would describe it. 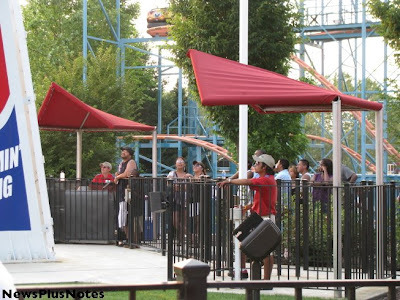 The supports for the ride (probably) can also be seen in a photo in this thread on KICentral, and they appear to be a light brown color, much like Maverick. If you haven't been following, the Halloween Horror Nights 18 website for Universal Orlando has been updating regularly. This year's website is a lot of fun - they present the crazed psychiatrist's "case files" and then allow us some insight into the patients treatment. There is plenty of scary audio and video to check out. IAAPA's magazine, FunWorld, has a nice article and interview with Hong Kong's Ocean Park about their immense expansion plans for the property. 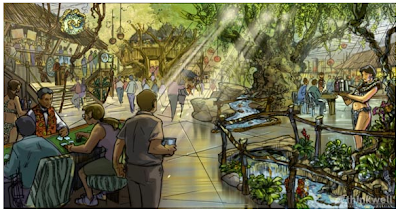 The animal based theme park has been giving Hong Kong Disneyland a run for their money lately, and these mega expansion plans will only complicate matters for the Disney operation going forward. Silverwood Theme Park has finally opened their new used coaster, Aftershock. 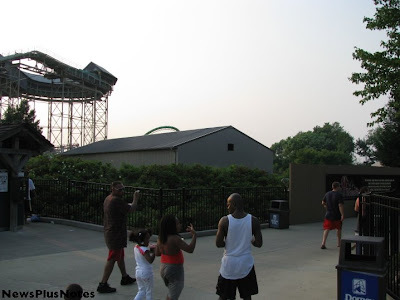 This is Deja Vu from Six Flags Great America, for those who didn't know. It's a massive ride for a park the size of Silverwood, so it should have quite an impact on the park now that it's operating. 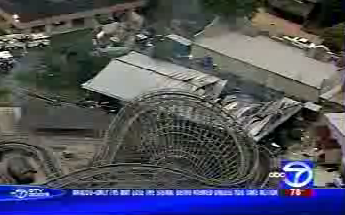 Head Spin at Geauga Lake is coming down in order to head to its new home in North/South Carolina. There's some photos in this thread on Geauga Lake Today. 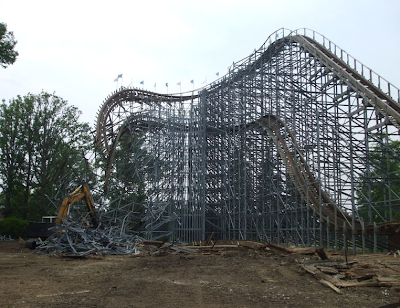 Villian is also being torn down now, a couple photos of that are located here. Remy, from Pixar/Disney's Ratatouille has started making appearances at Walt Disney Studios in Paris. I'm not sure if he's a puppet or an animatronic (thinking puppet), but he's cute and shows up under a platter just like in the film. You can read more and see video here. Cedar Fair put out a press release today to announce that they are going to try to start to do something that Six Flags has been doing for a couple years now: corporate partnerships. The company will team with The Kempton Group, out of - you guessed it - Cincinnati, Ohio - to basically sell their 18 North American properties as big advertising pens for people. Okay, that's a little harsh, but that's sorta what it is at time. 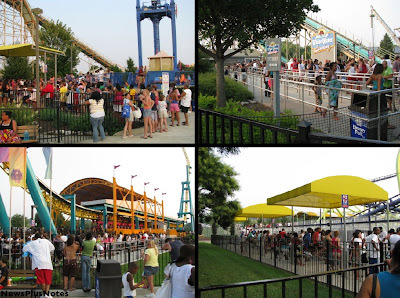 Even Six Flags made a big fuss over how long they have a 'captive' audience when people are at the parks. It makes sense, and Six Flags has brought in tens of millions doing it - and probably saving on food costs on some of the sponsored items. So from a financial perspective it makes sense, from a park atmosphere perspective? Well, if they do it like Six Flags, not so much. But the company is getting backed closer and closer against that financial wall - so every penny counts right about now. Looks like The Haunt at Kings Dominion will be expanding again this fall. The park's official website is saying there will be 2 new Haunts this fall, although the list of attractions is still the same from last year (not updated yet). 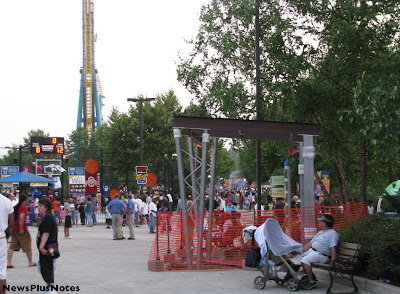 Also, KDFansite has photos of another haunt building going up next to the former Hypersonic coaster station. Last year they added one of these buildings inside Hurler's track for a Haunt maze, looks like this will be another. I wonder what their 2 new Haunts will be? I just read a very interesting rumor in this thread over on ThrillNetwork about Valleyfair! *finally* adding a wave pool to their water park in 2009. The rumor goes that the park's log flume will be removed in order to make this happen. 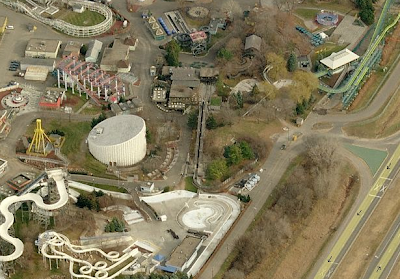 In the aerial above you can see how the log flume does sit nicely next to the existing water park. I can totally see a wave pool fitting in part of the flume's footprint perfectly - but it looks like there will be room left over. Future water park expansion? Between getting back from Vegas, returning to work, and moving into a new house - well - these pictures took longer than I wanted so my apologies! 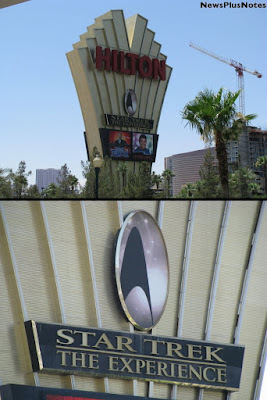 I've been to Las Vegas numerous times but as a non-Star Trek fan (just never really watched it, nothing against it) I never wanted to shell out the cash to check out the Star Trek Experience. Well, this time was different as it's now been announced that the attraction is closing Steptember 1st. ... which I totally love and think that every town everywhere should have one. (why do they have to be so expensive to build?) The Hilton is way up and sorta off the strip, so walking there was not a possibility. What's that I see? We must be in the right place, as the experience is advertised prominently on the Hilton's massive sign out front. 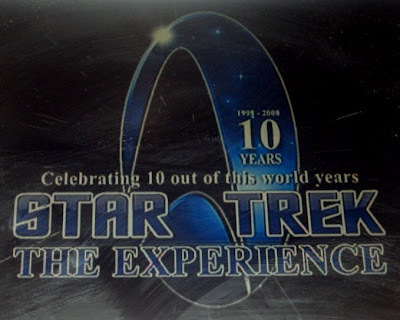 Star Trek the Experience is celebrating 10 years of operation this year. 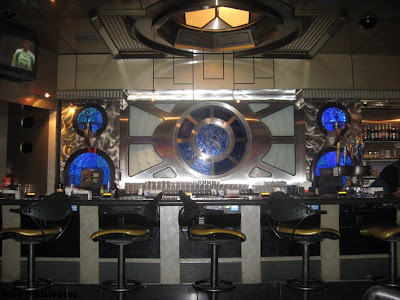 It opened January 3rd, 1998 as a $70 million, highly themed attraction that wet the pants of Star Trek fans everywhere. 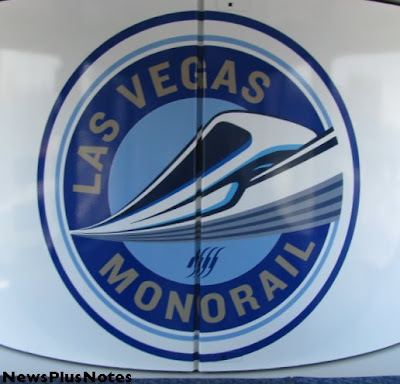 Designed by Landmark Entertainment Group and Paramount Parks, the attraction was a unique outside-a-theme-park themed experience that IMO only Las Vegas would have been a proper home for. 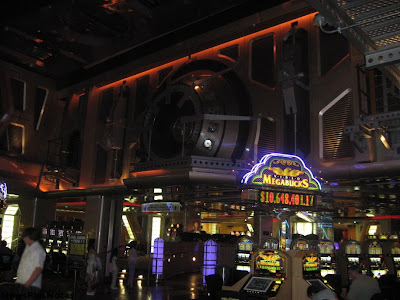 So the monorail drops you off and you enter the casino, and you actually end up in the Star Trek themed part of the hotel right away. 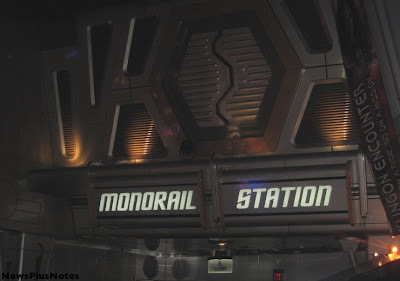 As you can see above, the theming hits you right away as even the sign for the monorail is themed. The casino located outside the entrance to the attraction is themed really nicely. As I said I don't know Star Trek so I'm not sure exactly what you're supposed to be in, aside from the obvious space ship of some sort, but it works. The lighting is really great on top of all the theming. 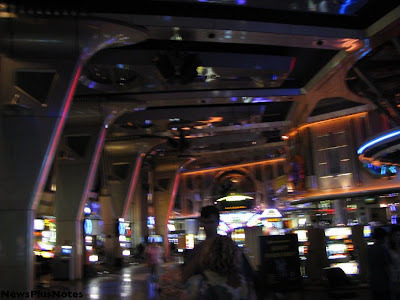 Sorry for the blurry, but you can still get a feel for the cavernous inside of the Trek casino. It's not just a static area, either, as the lighting is constantly changing and there's some props that move giving the area an 'alive' feeling. There's a nicely themed bar in the casino section, as seen above. 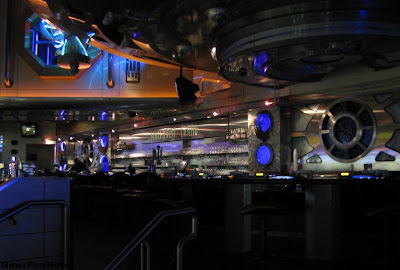 This is not Quark's Bar and Restaurant, though, that's located in with the attractions. Quark's is also apparently a huge hit with fans. 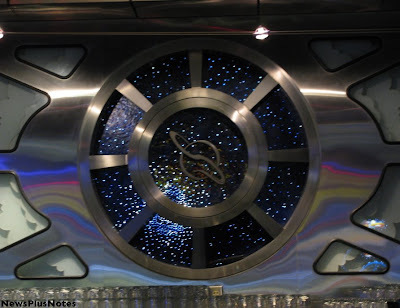 I really liked this 'window' that was behind the bar, obviously you can't get the feeling for it in a photo but the lights that are the 'stars' outside the window were great, flickering and changing. The same bar, again. I can't stress enough how well done the lighting is in the place, whoever worked on that deserves much credit indeed. Next I'll cover the two attractions of the experience, Klingon Encounter and Borg Invasion 4-D.
Well, now that a section of the Lost Continent at Florida's Islands of Adventure theme park has been closed off, it hasn't taken long for stuff to start to come down. 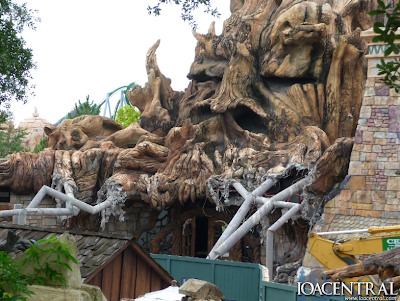 As you can see above, the front facade of the Oak Tree Tavern restaurant has already started to be ripped off. The Oak Tree is one of the buildings that will be turned into the Harry Potter part of the park. IOACentral has photos of all these changes, as well as an interesting rumor about the Rockit coaster going in at Universal Studios Florida in this update. Steel Hawg at Indiana Beach opened while I was in Vegas, I think. Above is a video of the ride in action. That's insane! I'm not sure I would want to ride, those restraints have to hurt... anyone been on it that can comment? 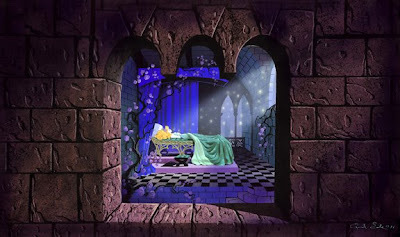 Disneyland Resort announced yesterday, during the park's birthday celebration, that the Sleeping Beauty walk-through attraction inside the park's icon castle will reopen for this winter's holiday season. The reopening has been rumored for a while, and after work walls went up in the area things looked even more certain, but now it's official. When the attraction is opened again, it will have been enhanced by the imagineers, and will include new special effects and technology not available in previous incarnations. I never got to check this attraction out, as it was closed during my visits - I'm looking forward to seeing this new version one day. I can only wish I was there to celebrate with you. I still love you even with your mini castle! Here is the 2008 park map for Six Flags Kentucky Kingdom. As we already know, a big section of the park is closed for this year. 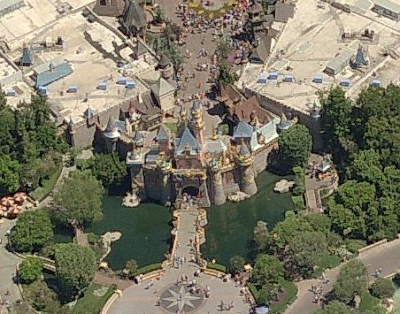 It's just interesting to see the park - the map reminds me of the park's size back in the mid 90s. Rumors persist that the closed area will not reopen next year, but will be gutted for something new, OR, that the park as a whole is on Six Flags' 'get rid of' list - which paints a much more cloudy future for the property. I personally have no idea what the future holds for this park but I'm curious to find out. What do you guys think? That debate, of course, is what is going to happen to the Busch Entertainment theme parks now that the InBev takeover of Anheuser Busch looks certain. The foreign brewer upped their takeover price to a point where AB's board can't really say no, but everyone is speculating that the new owner will try to sell the theme park division. With that sentiment pretty solid, the new question is who's going to buy them? 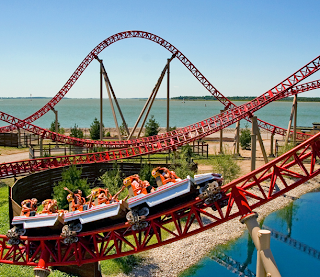 Six Flags and Cedar Fair are both in trouble financially, so take them out. After that, everyone from Disney to foreign park operators are being rumored. Kevin Yee over at MiceAge.com has a great article about these very possibilities that's worth checking out. Personally, I would love to see the theme park division spun off on their own, purchased by an investment group that would allow them to operate as they currently are. This way, these highly regarded parks could stay as they are now, well, maybe sans the beer - and act as a cash cow for whoever buys them. Whatever will happen, it will probably happen fast - so we might not have to wait long to find out the fate of these parks. This thread over at Geauga Lake Today has some photos of the demolition going on at the former Geauga Lake amusement park. They start in this thread and are constantly being updated. Lots of stuff is coming down. The Double Loop coaster was cut to pieces and hauled away, most of the Happy Harbor area is in rubble (above), the Monorail station was torn down, Head Spin and Americana are being taken apart, and the Villain wooden coaster is just starting to get the knife. It's also being reported on the site that Americana (ferris wheel), Black Squid (spider flat ride), and El Dorado (magic carpet flat ride) are going to Kings Dominion for next year. The news comes from a reputable source, and it's said that the rides will occupy Hypersonic's former area. So Carowinds get the park's Boomerang coaster, and Kings Dominion gets some flats. Cedar Fair is really stretching out the park's ride's all the sudden, perhaps because they are way strapped for cash these days? Hmph. 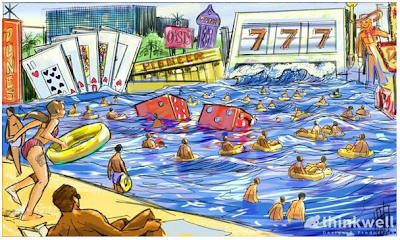 After my recent trip to Vegas, I began to wonder whatever happened to the Las Vegas Wet project that is supposed to be built. If you are not familiar, it is to include the largest indoor water park around, several hotels, a large indoor skiing facility, an outdoor theme park, tons of retail and food, and more. I was wondering about the project's status because I noticed on this recent trip the number of families that are still visiting with children, and how the city has reverted back to really being only for adults. Well, Last Vegas Wet certainly would give those families stuff to do together again, so I was happy today when I googled the project and found that a press release had just been issued an hour before. Though no construction is underway, the project is still said to be moving forward. 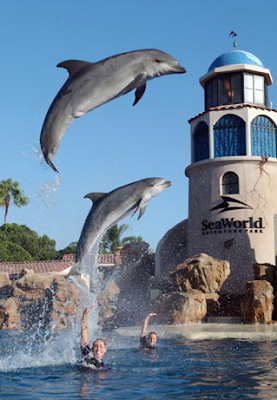 Wet Holdings, the company behind the project is now saying that they are looking to take on strategic mergers and acquisitions in the theme park industry that would allow market capital to grow, and provide a positive cash flow for the operation. To me, that reads as they don't have the cash to start the project alone so are looking to expand in other ways in the meantime. They say they have made some offers to "very visible brands" in the theme park industry, so perhaps they'll end up with a Six Flags or Cedar Fair clunker, lord knows both companies need the cash.